People are still talking about the brilliant performance that UFC welterweight champion Tyron Woodley put on in his latest title defense. As seen in the main event of the UFC 228 pay-per-view event on Saturday, September 8, 2018 in Dallas, Texas at the American Airlines Center, Woodley was able to score a second-round submission victory over Till to retain his title. 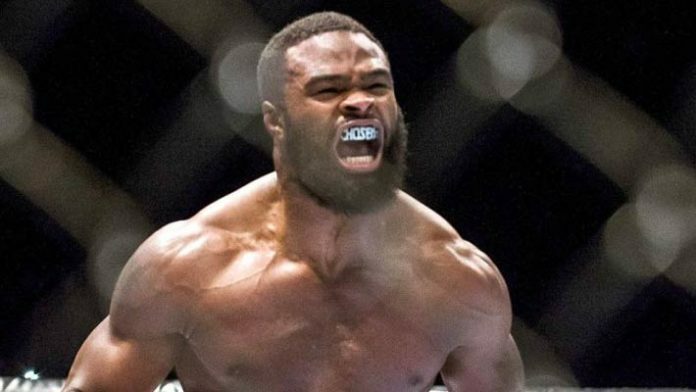 One of the coaches of the welterweight champion, Din Thomas, recently stated in an interview that the gameplan of Woodley’s success in this fight started with early aggression against the rising prospect. Although most fight fans didn’t think Woodley submitting Till was a possibility, Thomas stated that this is how he thought Woodley would win at UFC 228 when they were planning for it. “A lot of people don’t realize that Tyron trains in the gi as well, and even if he didn’t, his grappling is still up there with the best of them,” Thomas said. “I told him the other day, you know I do all the drilling with the guys, and prior to this camp with Tyron, the most vicious guy that I’ve drilled with is Antonio Carlos Junior, who’s a world champion in jiu-jitsu. Tyron felt worse than him as far as transitionally and his pressure and just his ability for control and finding submission. He felt worse than Antonio Carlos Junior. Woodley is expected to make his next title defense against former interim champion Colby Covington at an event that has yet to be officially announced. Woodley wasn’t given a lengthy medical suspension so it’s possible that the Las Vegas-based promotion can book this fight either later this year or early 2019.